Check out what our students are accomplishing in the classroom, in the community, and around the globe! 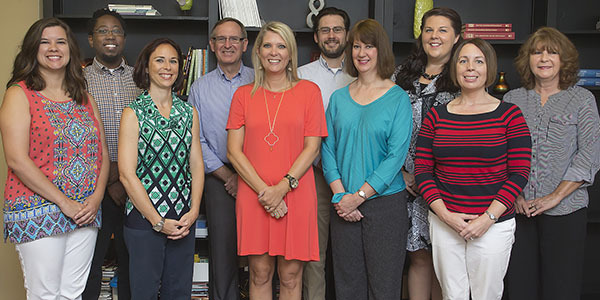 Valdosta State University’s Counseling Center celebrates 17 years of accreditation by the International Association of Counseling Services (IACS). Valdosta State University’s Model United Nations team won the Distinguished Delegation Award and five Outstanding Position Paper Awards at the 2019 National Model United Nations Conference in New York City, setting a record for the most awards VSU has won at the conference. Sara Brook Rice of Woodstock, Georgia, is the recipient of the Spring 2019 President’s Award for Academic Excellence for the Harley Langdale Jr. College of Business Administration at Valdosta State University. Daniella Barta of Iszkaszentgyörgy, Hungary, is the recipient of the Spring 2019 President’s Award for Academic Excellence for the College of Humanities and Social Sciences at Valdosta State University. Ansley Ruby Watson of Hoschton, Georgia, is the recipient of the Spring 2019 President’s Award for Academic Excellence for the James L. and Dorothy H. Dewar College of Education and Human Services at Valdosta State University. Amanda Rachel Miller of Leesburg, Georgia, is the recipient of the Spring 2019 President’s Award for Academic Excellence for the College of Science and Mathematics at Valdosta State University. Amber Mariah Hughes of Macon, Georgia, is the recipient of the Spring 2019 President’s Award for Academic Excellence for the College of Nursing and Health Sciences at Valdosta State University. Stephanie Morgan Stanley of Vidalia, Georgia, is the recipient of the Spring 2019 President’s Award for Academic Excellence for the College of the Arts at Valdosta State University. Valdosta State University’s 45-member Wind Ensemble will perform at 7:30 p.m. on Tuesday, April 30, in Whitehead Auditorium. Admission is free of charge and open to the public. Valdosta State University presents Mayhem Music Festival 2019 from 6 p.m. to 11 p.m. on Friday, May 3, on the Front Lawn. Admission is free of charge and open to the public. Valdosta State University will present De-Stress Fest from 1 p.m. to 4 p.m. on Wednesday, May 1, in the Student Union Ballrooms. Students are invited to take a break from the end-of-semester rush and enjoy some dog therapy, massages, games, and more.